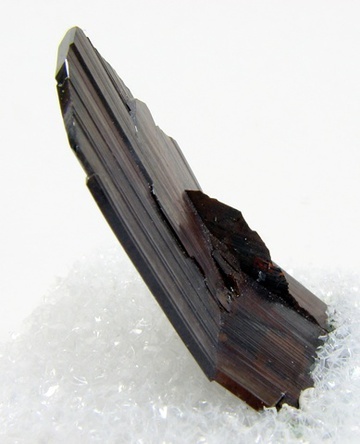 while looking at the best minerals- Tourmaline I noticed a couple of bent crystals. have always had an affection for this type of specimens.so thought to try a new string for the new year..... odd balls of the mineral world. 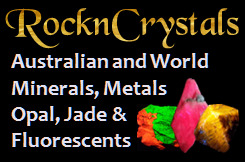 if you have a bent, deformed or unusual crystal - lets see it. 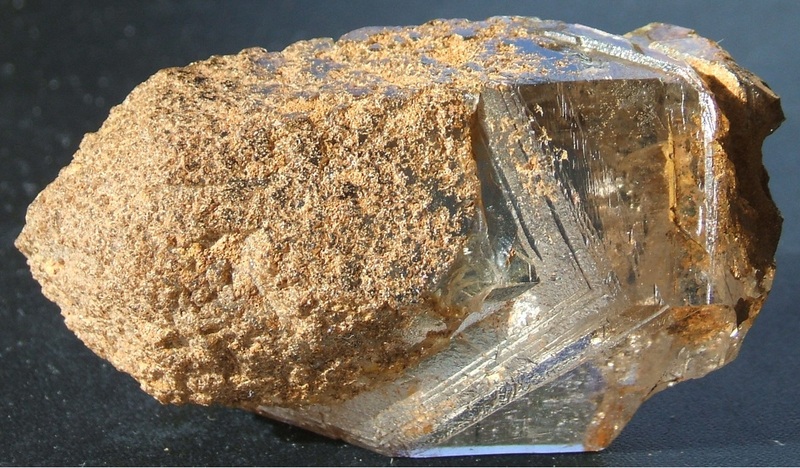 to start this thread I have selected the strangest Quartz I have seen. think it is a good example of a cubic habit. it is fully terminated and only damage is a small chip on one edge. Edited 1 time(s). Last edit at 01/01/2014 02:57AM by Tony Charlton. Hi Tony - Happy New Year! 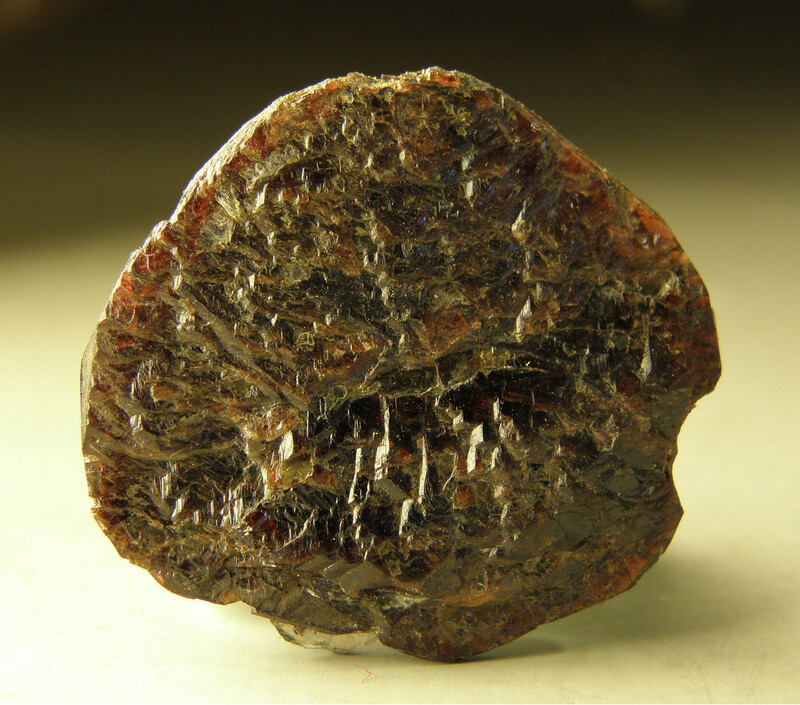 My contribution for today - a brookite that from the front appears not too bad, but from the side, you can see where it was once broken and then rehealed. Here's my contribution. 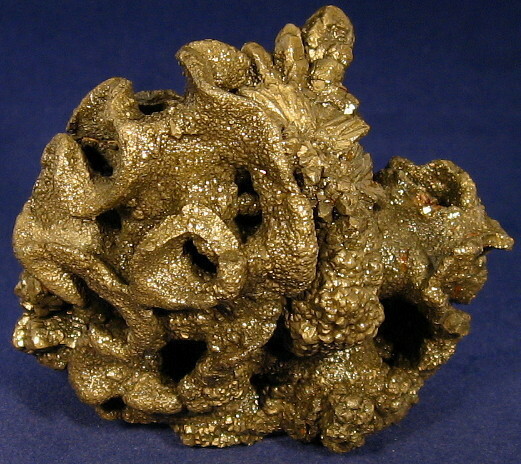 A self-collected baryte crystal from a septarian nodule. 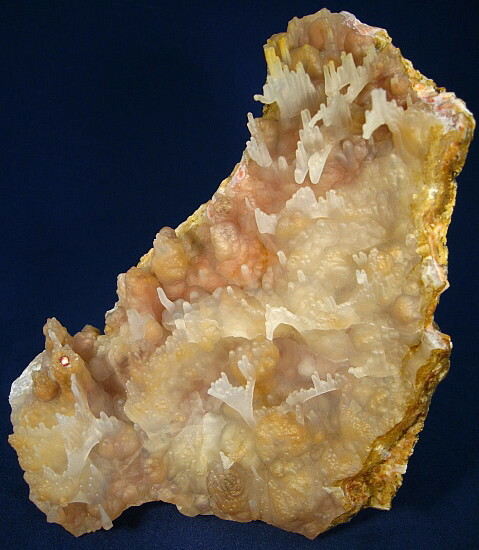 The crystal has been cracked during formation by further expansion of the nodule, which pulls the interior apart, and then self-repaired as it continued to grow. Edited 2 time(s). Last edit at 01/01/2014 04:49PM by David Baldwin. This may only qualify as out of the ordinary for me, but here is a 2.9 x 2.4 x 3.3 cm gem clear quartz crystal that I found several years ago from Missouri Ridge in Chaffee County Colorado that was broken and rehealed making for a somewhat unusual termination. 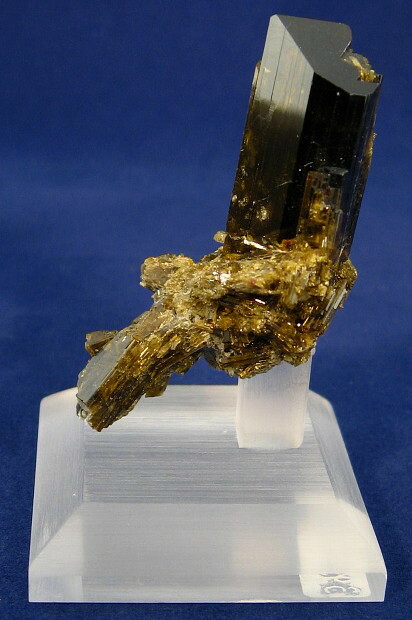 A beryl 'worm' in smoky quartz matrix. Many of the beryls I found from this pegmatite are rehealed in quartz matrix, making them impossible to remove in one piece. Collected Sept of 2013. 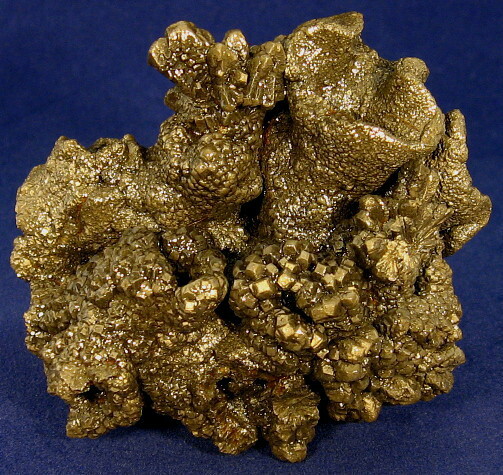 Size of specimen is 3cm x 2cm. This is a fun and interesting topic. Crystals are not supposed to be curved. It is difficult to have symmetry that way. Several intergrown cyrtolites appear bloated with their curved surfaces. 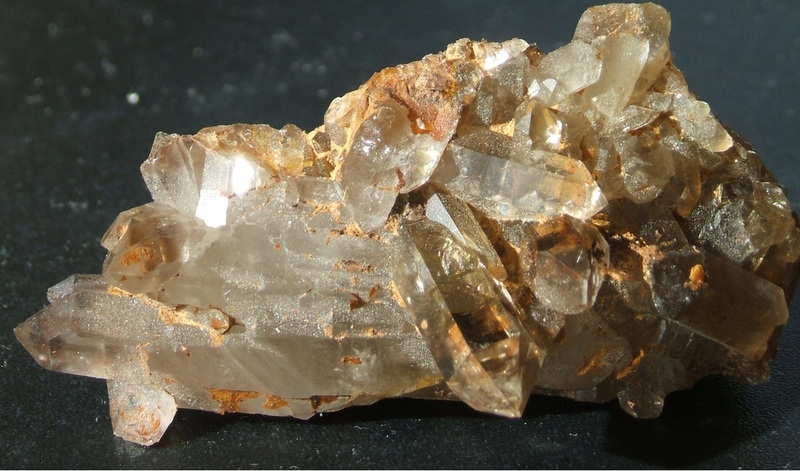 Here are two different views of a bent smoky quartz crystal on fluorite that I found near Lake George, Colorado several years ago. 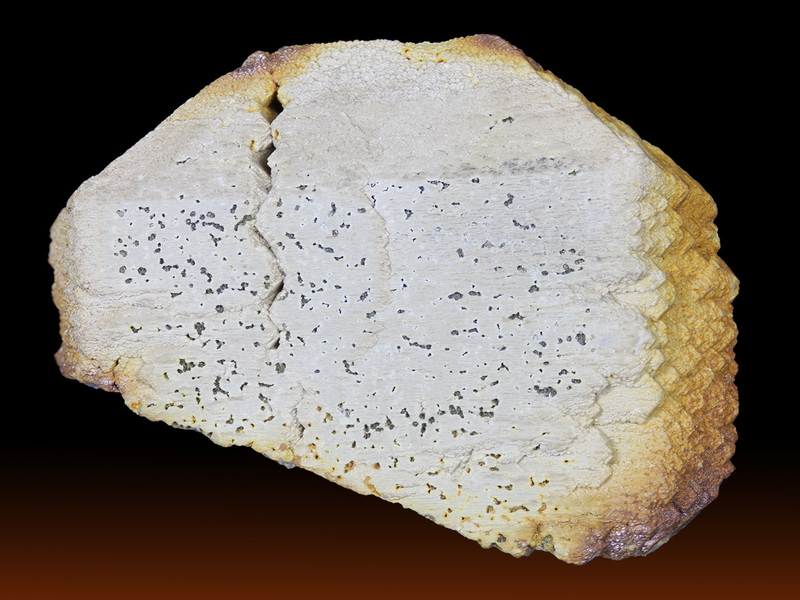 The smoky is approximately 11.5 cm long. Maggie, does the small crystal on the front of your Brookite show any damage? 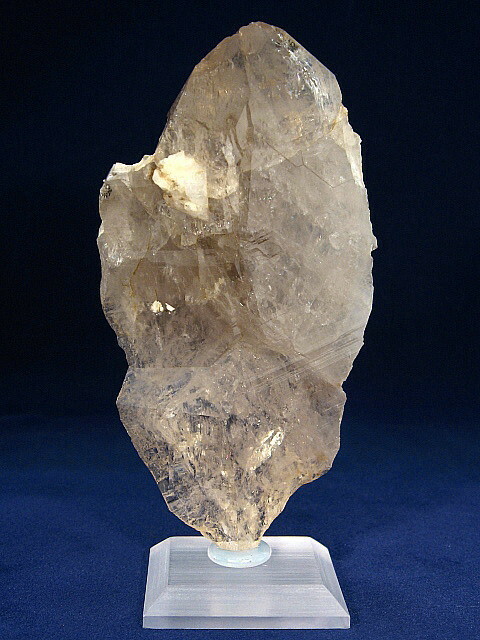 David, the deformed termination on your Quartz looks like something blocked the growth, possible a penetration twin (minus the penetrated part).could you post different angle pictures? Here's my contribution to your 'bent' thread. 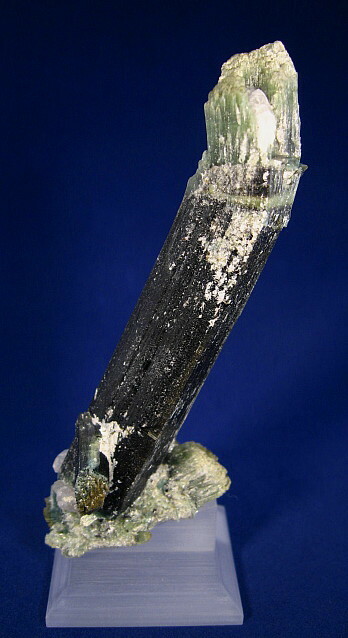 This is a 40mm schorl I collected in 2009 from the Maine Feldspar Quarry, Mt. 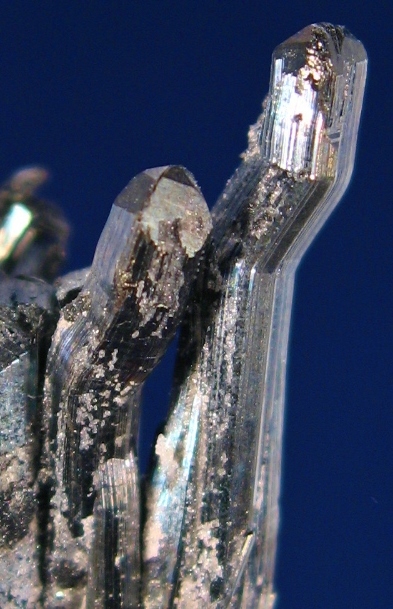 Apatite, Auburn, Maine. Hey... The smaller crystal does not have damage where it intersects the main crystal. I assume, therefore it grew after the healing. Here are a top down and up through the polished bottom view of the one I posted above. It does look like the growth was blocked with a possible penetration twin. 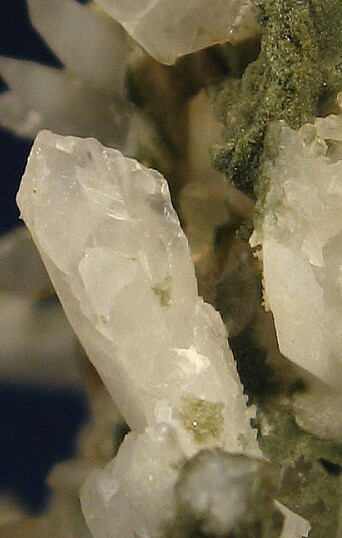 I hadn't previously noticed the neat parallel silver metallic thread inclusions seen in the bottom view through about 3cm of quartz. Looks like another one I need to add to my need to ID list. I have to wonder if a misaligned atom or molecule. 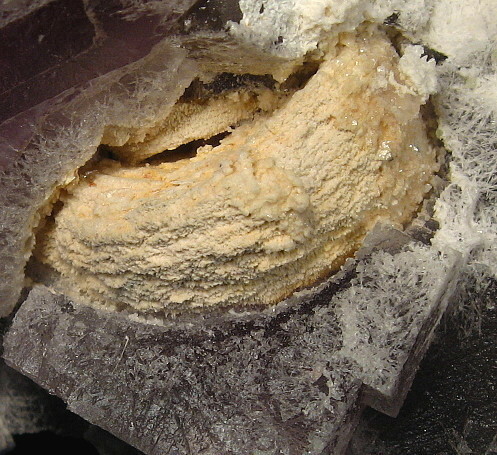 in the first stage of the crystals growth, could pass the deformation along throughout the whole growth. 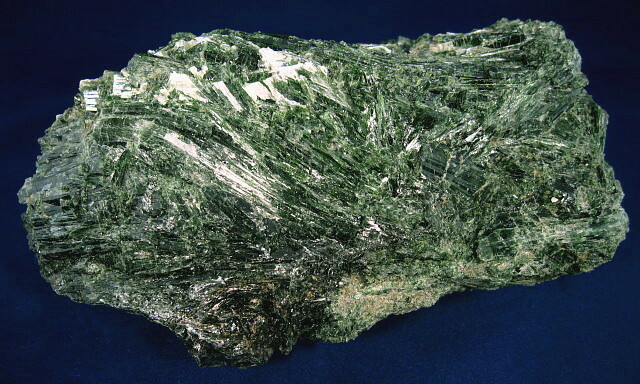 Thus causing a crystal like Maggie's Brookite with an apparent break, that has an undamaged crystal across the deformation. PS I am not a mete crystal mambo jumbo type. Found this in a faulted Paleozoic volcanic ash (the central sierra nevada crest, Ebbits pass area) . 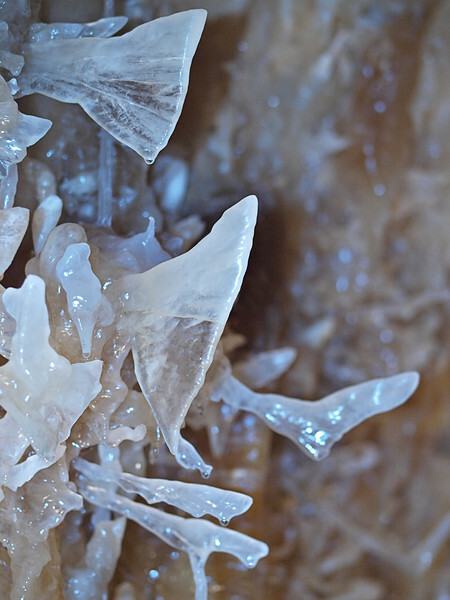 The crystallization only accrued on one side of the broken pieces of the seam. 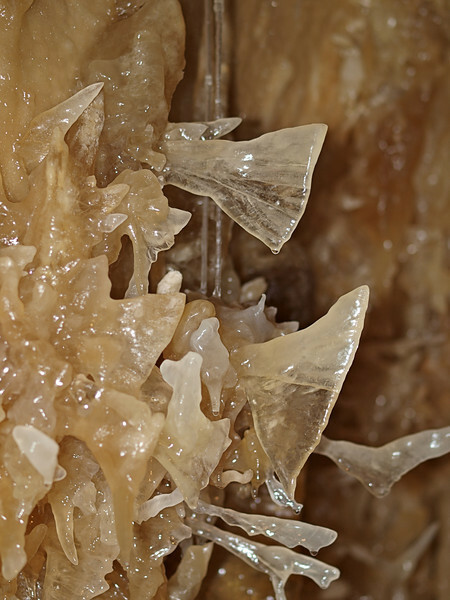 They appeared to grow from the upper surfaces, hanging into the voids . The Crystals were very fragile and none made it back home, although this one did get to my truck. The reason this one is in the string --- it was the only one that looked like a palm tree in a hurricane The others of its type were all needle tips or grew into the adjoining rock on their terminations, It was about 1.5 cm tall. Have no ideal as to the identity of the crystal(s). this pic. 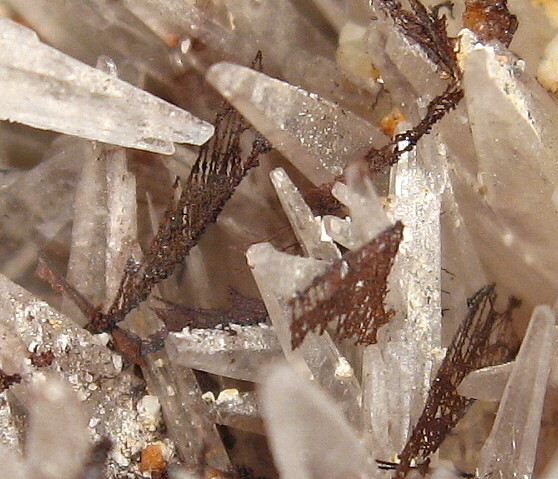 shows the typical crystals and their orientation within the seam. the chunks of ash are still attached to each other in this pic. Edited 1 time(s). Last edit at 01/03/2014 07:06PM by Tony Charlton. 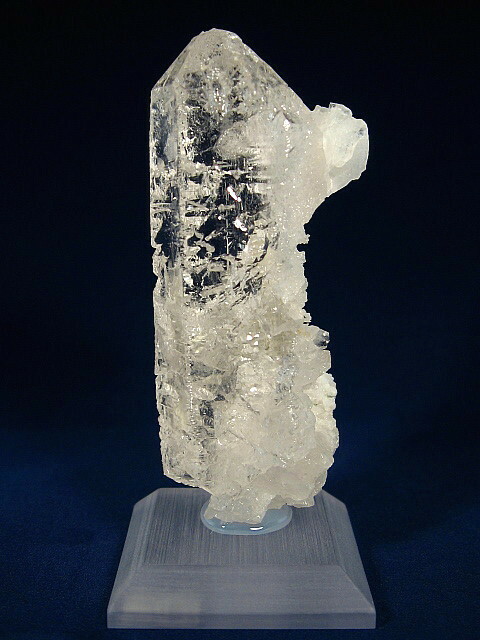 The curving, partially fractured and healed main crystal is about 85mm long. 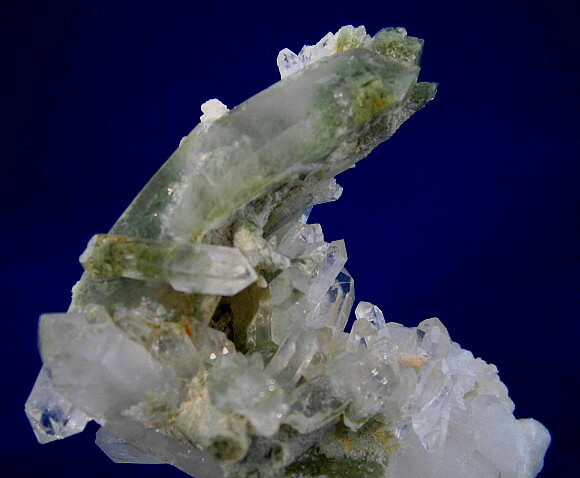 Quartzine, Chalcedony and Quartz from Barros Cassal, Rio Grande do Sul, Brazil, 73 mm. Edited 3 time(s). Last edit at 01/04/2014 10:26AM by Grzegorz Słowik. In reference to the term rehealed - should we not be using healed instead? Rehealed implies that the crystal was broken twice. 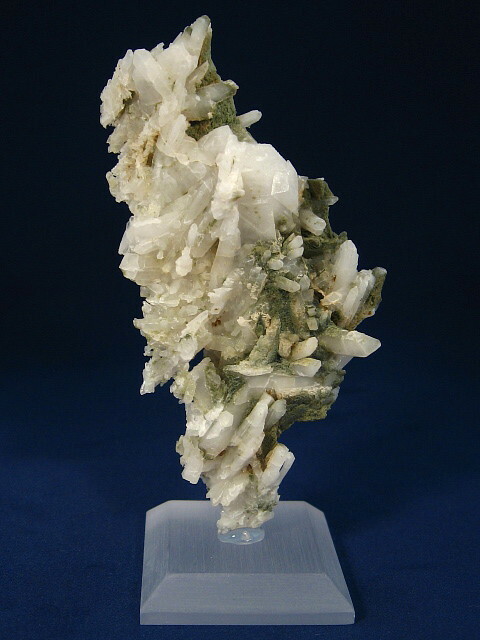 Quartz from the CK Claim (aka Happy Claim), Bottomly Prospect area, North Trinity Range, Pershing County, Nevada. 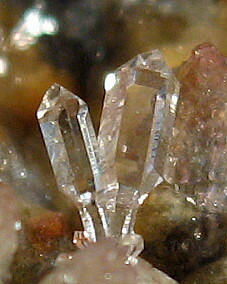 curved crystal 3.4x1x1 cm. This smoky quartz I collected always struck me as strange and deformed as were several that came out of the same pocket. Edited 1 time(s). Last edit at 01/03/2014 10:43PM by Michael Otto. 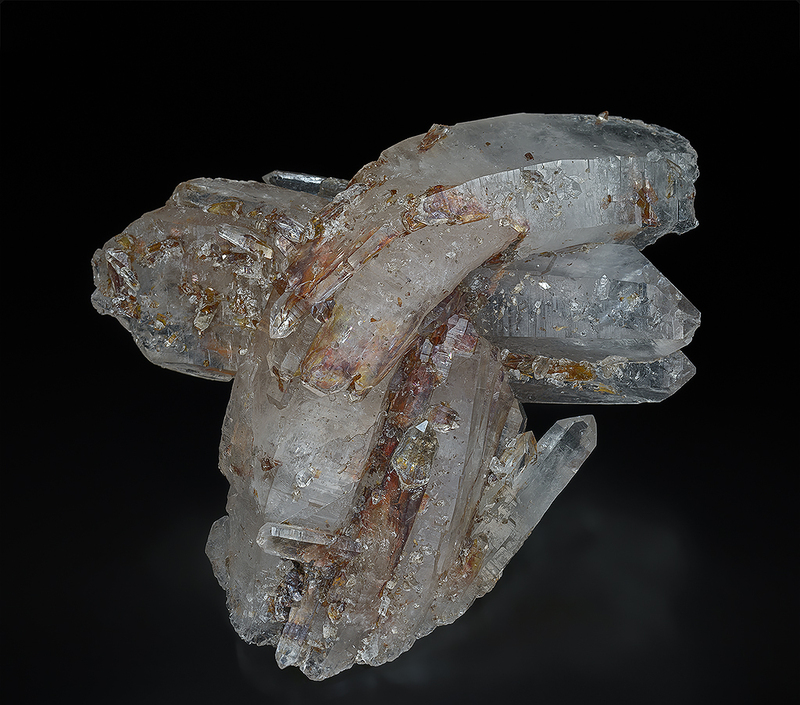 Here is a curved quartz from Altoona, Washington. It would be about 9mm long if straightened. Not bent, but definitely a strange habit. Schorl (or some other black tourmaline - blacker than the photo looks...) 35 mm long overall. Ex Harry Dryer specimen, origin unknown. Not sure if there was once another crystal growing from the pit or ??? 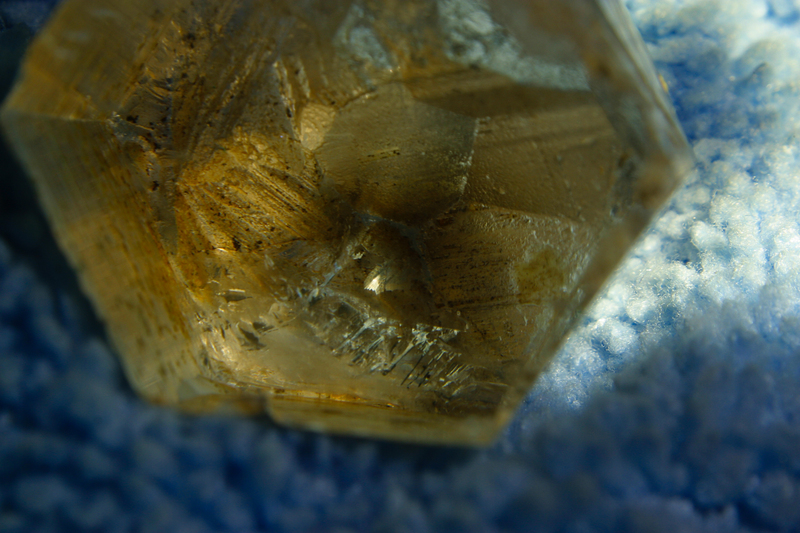 Thats a contact mark, from quartz or garnet i suppect. here !s my contribution: want to talk about bent? 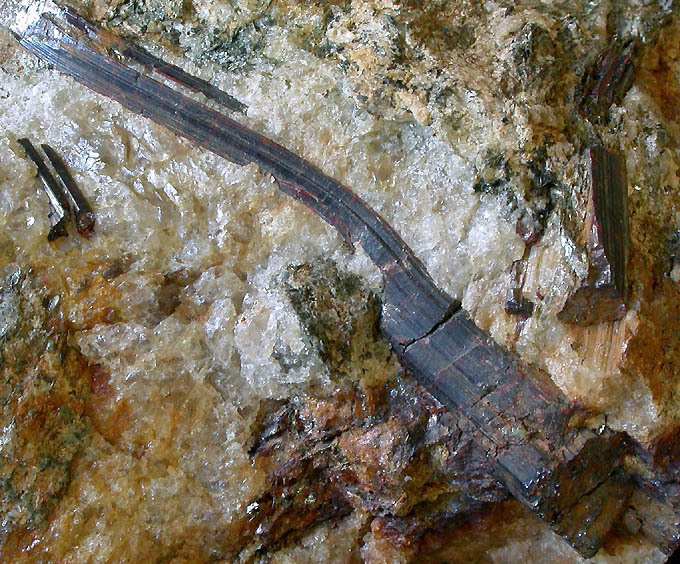 This is really bent (curled) : Malachite fibrous crystals from the Clara mine, Oberwolfach, Germany. I agree with Wayne. In that place was garnet. realy loving the response to this thread! Michael-- could you post a side view or two? 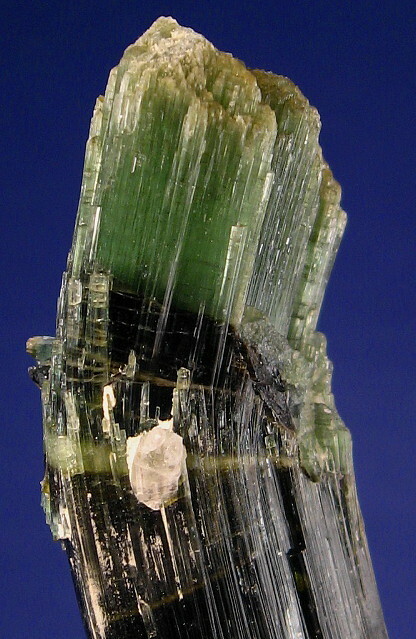 the hole in Dan's Tourmaline has 8 sided symmetry and probably was not Quartz. 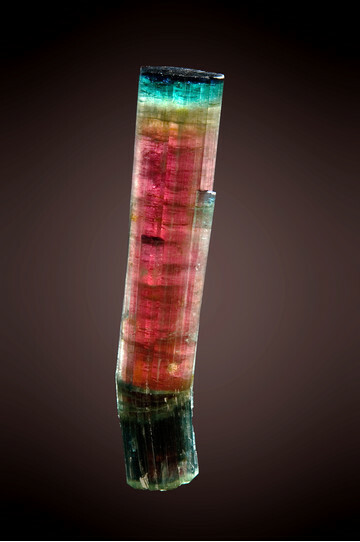 could be Garnite or another tourmaline? Pierre--- could the Malachite be psyedomorphed after Silver? Edited 1 time(s). Last edit at 01/06/2014 01:57PM by Tony Charlton. 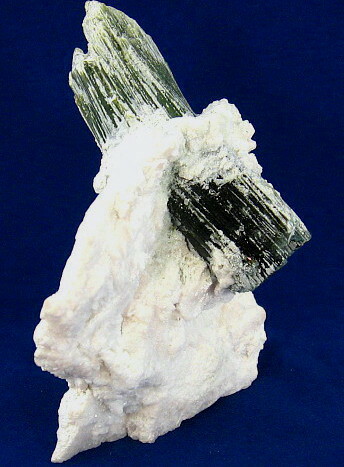 A curved 'Blue cap' Tourmaline from the Sapo Mine (13,7cm x 2,8cm). > realy loving the response to this thread! > Michael-- could you post a side view or two? Tony, First pic is from the back of crystal(s) 2nd is from side and last another odd 9cm crystal from the same pocket with a similar look. Edited 1 time(s). Last edit at 01/05/2014 05:14PM by Michael Otto. Great Sapo Bluecap, Mario........and interesting bends in your Brazilian tourmaline, Rui. 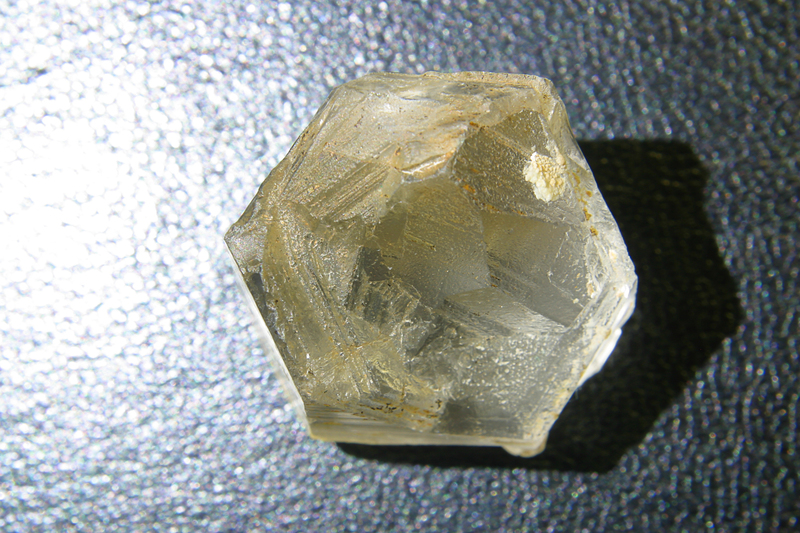 Here is a bent elbaite from Pech, Afghanistan. 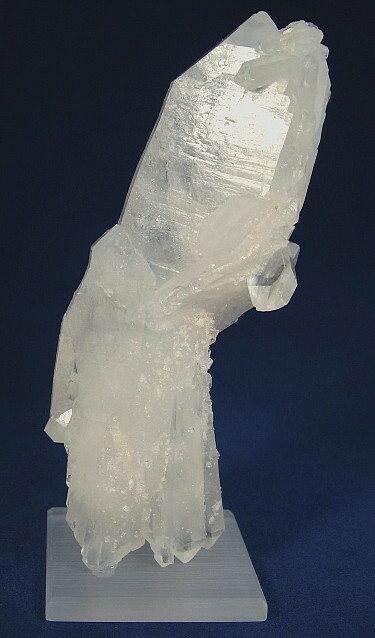 Bent quartz crystal from Brazil. 10.5 x 10.4 cm. 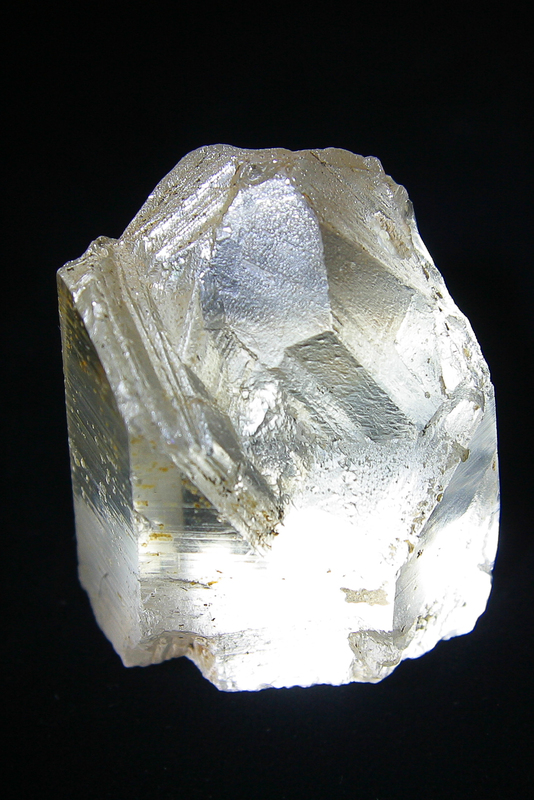 Etched quartz from Brazil. 15.1 x 3.3 cm. Edited 1 time(s). Last edit at 01/06/2014 08:09AM by AM Mizunaka. 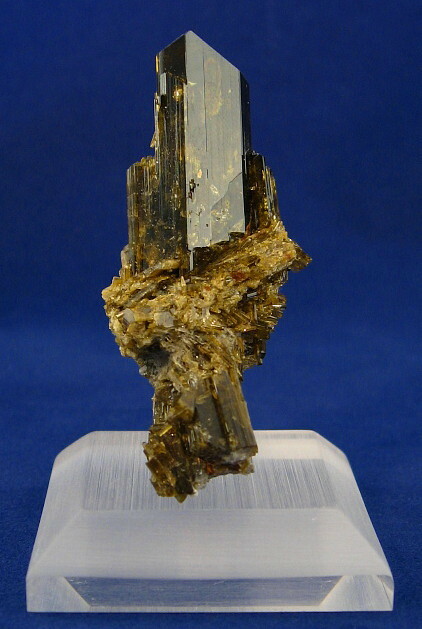 This epidote cluster is bent into two different directions due to tectonic movements during the growth stage of the crystals. Alchuri Alpine Vein, Gilgit-Baltistan, Pakistan. 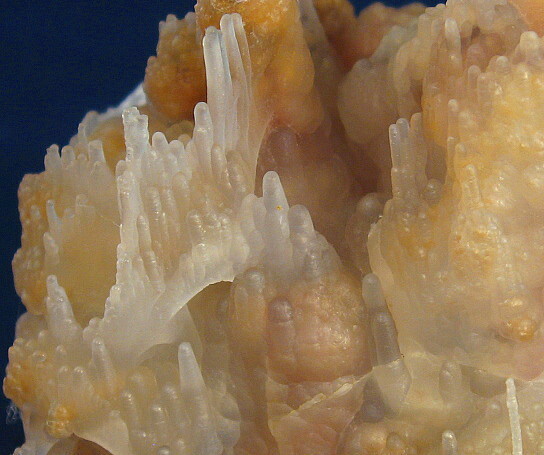 Well-formed "ram's horn" selenite cluster, formed by thin curved, parallel crystals. 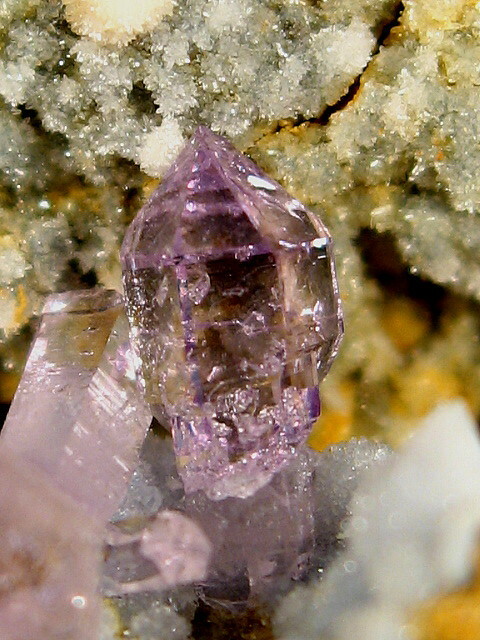 This kind of formation occurs when one side of the crystal grows more rapidly than the other. Maggie -- do the other Fuorapatite crystals in the specimen show deformations. if so do they alligne with the main bent one? Micheal --thanks for extra pic's. AM --that is the largest angle bend I have seen, wow!!! Karel --must have taken a while to put such a good collections together! very nice!!! 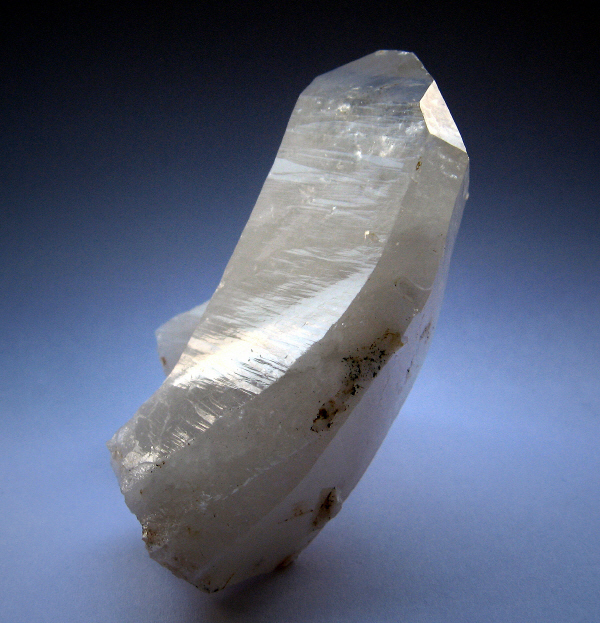 Grzegorz --nice Quartz, neat unusual habits. again thanks to all contributors. loving it!!! here is My latest contribution to the thread. 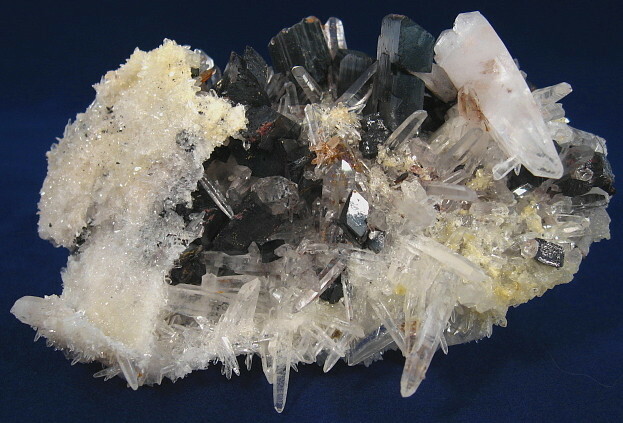 this is a Quartz that shows two growth interruptions created by other types of minerals. check out the child pics. 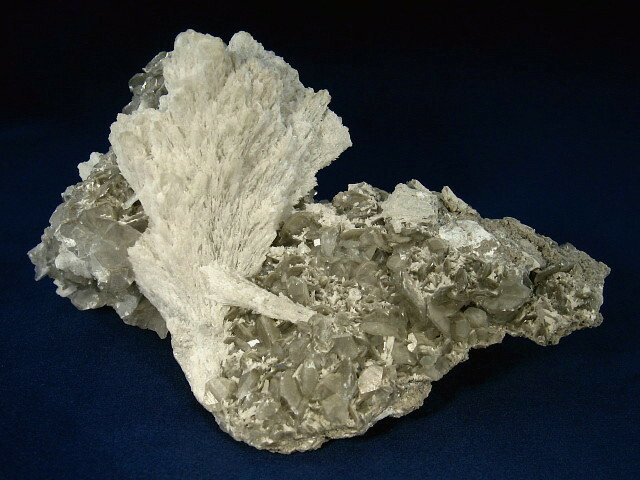 Gypsum "flower" from the Ute Mountain Indian Reservation, Mancos Canyon , Colorado. 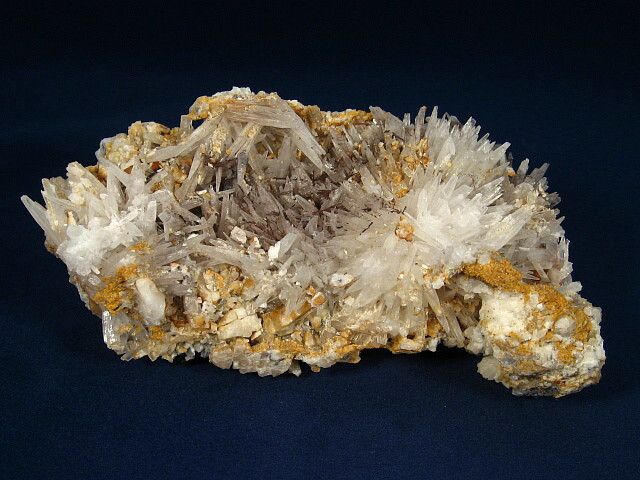 Collected in September 1990. Here is a photo of some interesting Quartz crystals I found at Hermit Island in Phippsburg,Maine near my home. from this seam but have never found any others. Edited 3 time(s). Last edit at 02/21/2016 04:14PM by Clifford Trebilcock. 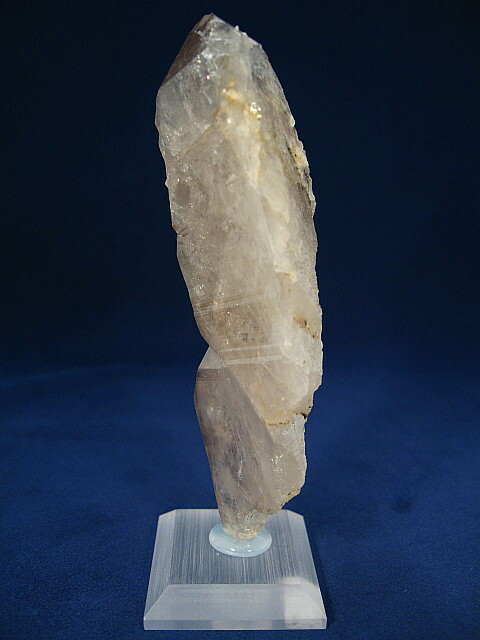 A particularly nice bent quartz crystal, 10cm tall. From pocket I found in 2010 in Belgium. Edited 1 time(s). Last edit at 01/08/2014 07:24AM by Harjo Neutkens. 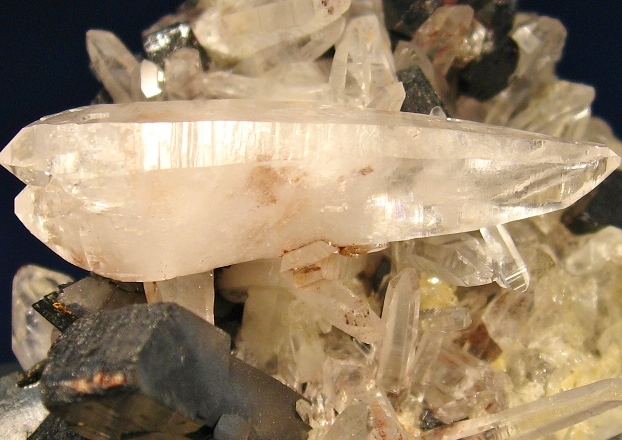 Will someone please step forward and create a Best Minerals article entitled bent crystals? 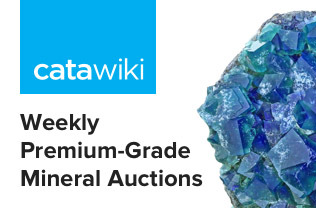 To answer your question, "Do the other Fluorapatite crystals in the specimen show deformations? If so do they align with the main bent one?" Sort of... How's that for scientific? Mickey --looks like a shadow puppet. Clifford --strange one for sure. Maggie --that is to bad, it is a nice piece. another bent Quartz --not as bent as some previous post but it is what I have. von mir ein interessantes Stück aus Deutschland. Fluorit-Oktaeder mit gekrümmten Flächen. Deutsche Sammler nennen diese Varietät des Fluorits "Ochsenaugen". Der genaue Fundort ist Schönbrunn,Vogtland ,Sachsen. I love odd and etched crystals and it is refreshing to see everyone's weird specimens. It is amazing to see what nature can create. 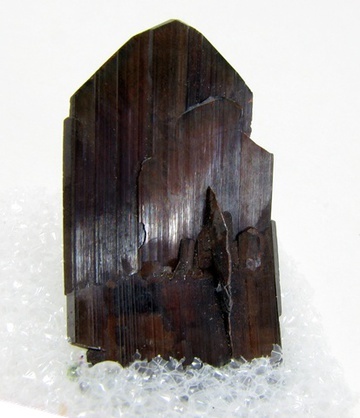 Here is a strange a and severely curved Schorl crystal I have had in my collection for many years. It has a very pronounced curve and is complete all around and terminated. Edited 3 time(s). Last edit at 01/09/2014 05:11AM by Marc Miterman (2). 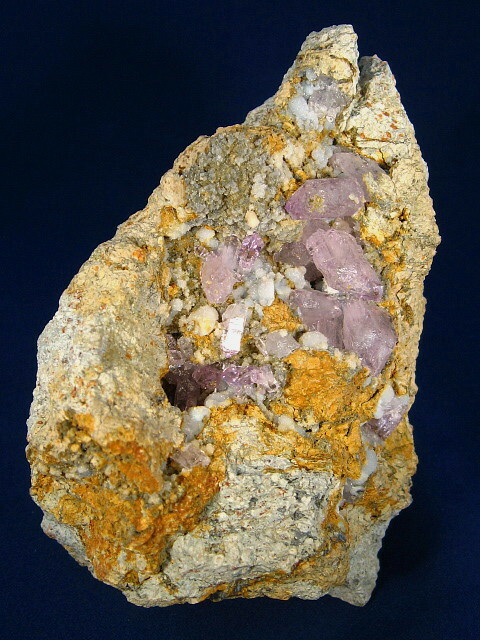 This is a curved lepidolite "stack" from the Strickland Quarry in Portland, Connecticut, which was collected in 1985, before the site was closed. Hey guys, it's cool to see so many interest for such a topic, therefore I will add some more pictures. 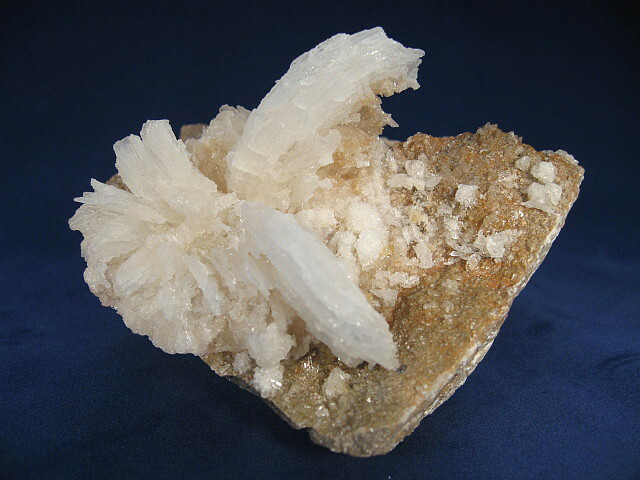 A treelike aggregate of white curved strontianite crystals surrounded by calcite crystals. Edited 1 time(s). Last edit at 01/10/2014 02:56PM by Karel Bal. 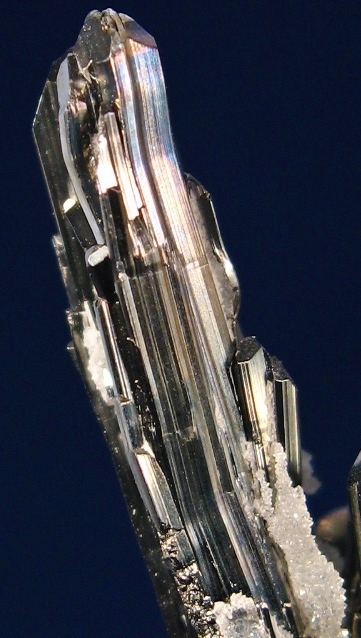 A well-terminated spray of metallic long prismatic stibnite crystals, showing interesting curvatures. FOV: 40 x 25 mm. 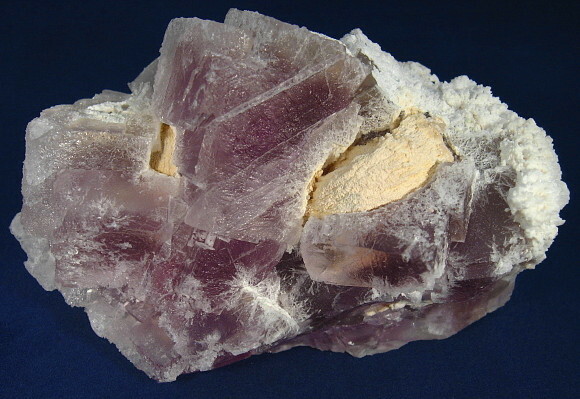 An unusual combination of fluorite with curved "ram's horn" selenite crystals inside. Edited 1 time(s). Last edit at 01/10/2014 03:49PM by Karel Bal. Karel, that thing is amazing! Cool thread with more than a few curves! Here is another growth interruption example. 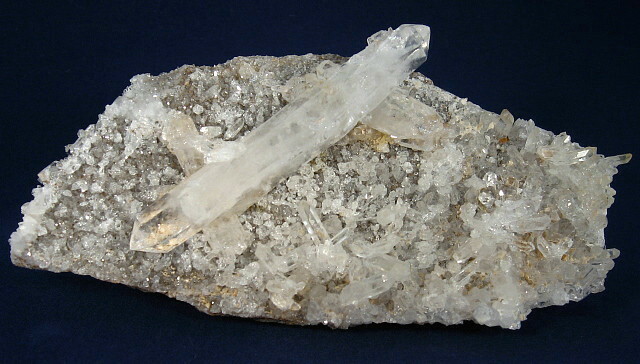 a 2.54 cm Quartz. 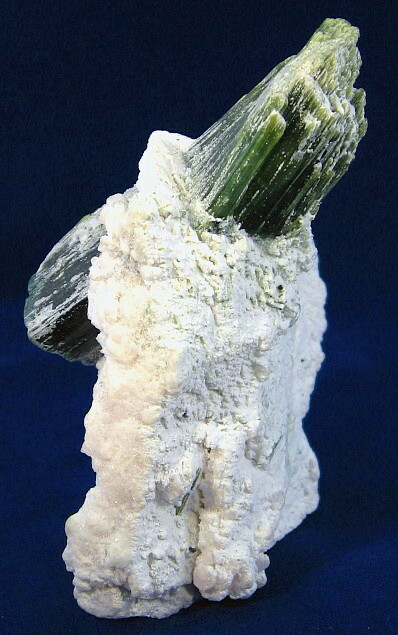 the termination was covered with chlorite and the only area that continued to grow was along 3 edges of the termination. this formed a "wall" along those edges. does not show well but the "wall" has a lot of terminations. this crystal has a complete termination with no chips. This post is of crystals that are not in My collection , but they fit the string so well. The subjects of the post are in a Marble cavern next to an old (for California) gold rush mine town called Valcainoville. The Black Chasm cavern is a small hole that was opened as a "park" about 10 years ago. It was first explored by the 1849 miners, but they did not get past the "chasm" . In the late 1990's the property was acquired by the state, and a stair was installed. Some more Helectites from the Black Chasm caverns. The guides claim that this cave has more Helectites than any other known cavern. Some of them are half a meter long! 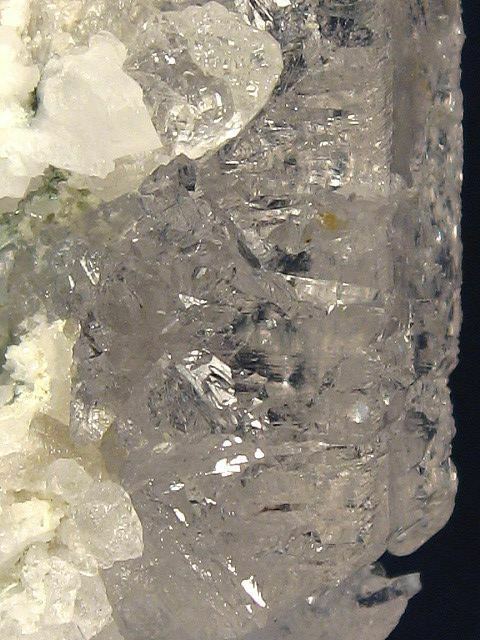 different view shows "the dragon" is several crystals. I do not know if it is the most helectites in a cave, but there are a lot of them in this cavern. Some walls in the cave are covered with the helectites for 15 meters! One more of the Black Chasm. Helectites, you say. 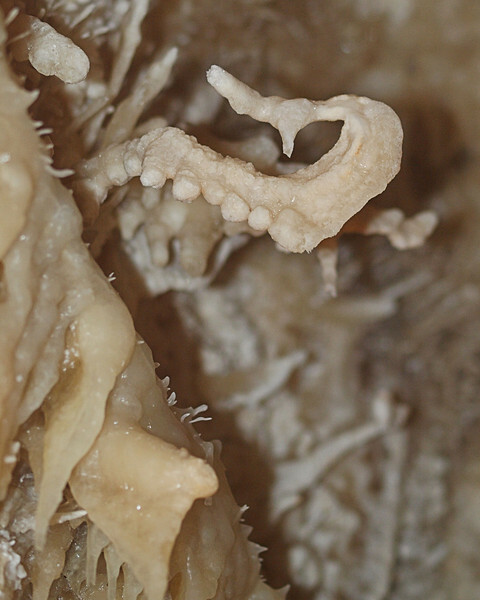 Here are a few for your perusal, from the Caverns of Sonora, in Texas. Here is a link to more pics from the Cavern. Helectites are in the latter pages. So far there have been a lot of wonderful specimens (tu) posted, please keep them coming. I can not believe this is all the mindat community has--please, lets see some more of the bent, deformed or strange habits. 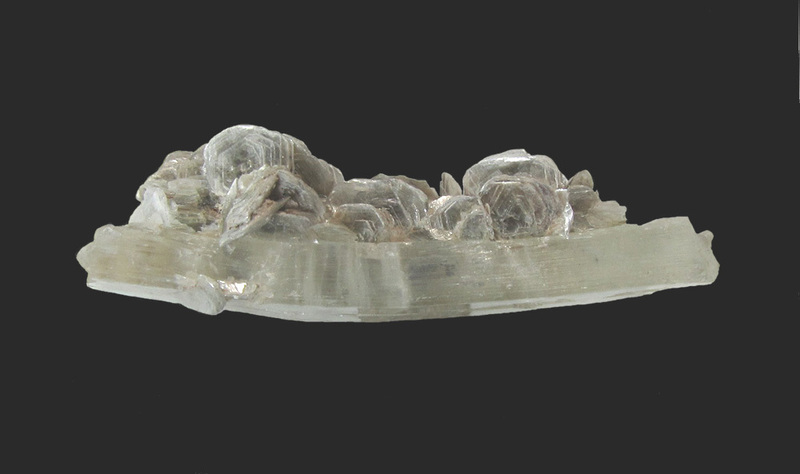 Here is My new post of a bent Quartz, size is about 3 cm. long. 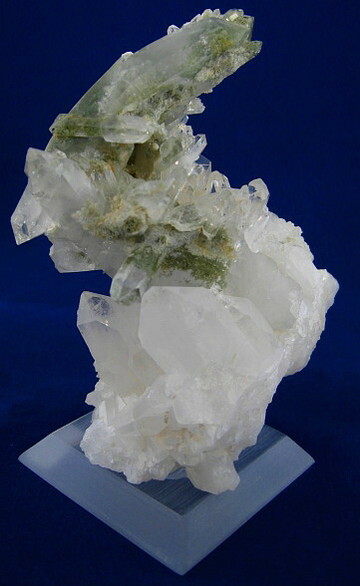 I think this is a Faden Quartz, but am not sure. 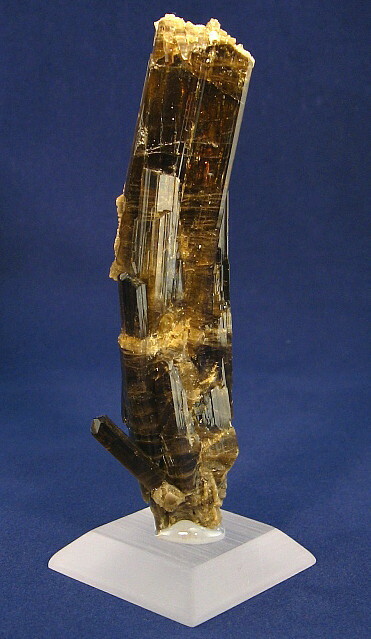 This is a bent tourmaline, var. 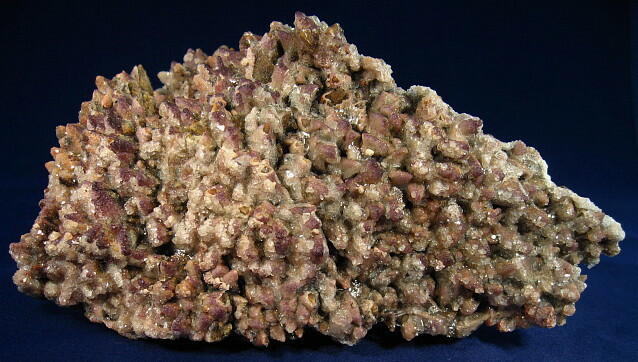 dravite, from Codfish Hill in Bethel, Connecticut, collected in the 1970s.